On July 20th the FARC (Revolutionary Armed Forces of Colombia) implemented its second unilateral ceasefire of the year, with the government offering to de-escalate its violence as well. These are positive steps for the public confidence in the peace talks, as well as the lives that will be saved while the ceasefire lasts and de-escalation of violence is realized. 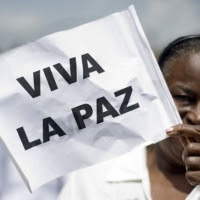 After the last unilateral ceasefire offered by the FARC (December 2014 to April 2015) was abandoned and the conflict reached its most violent period since the beginning of the peace talks (2012), the public trust that a final peace will be agreed on has reached a dramatic low. With these new commitments to de-escalate the armed conflict, re-building the public confidence will be crucial. In the more than 50 years of the conflict between the FARC and the government of Colombia, it is estimated that over 260,000 people have been killed (the majority of them civilians) and over 6 million have been displaced (the majority of them rural poor, indigenous or Afro-Colombians). Those most vulnerable to suffer from the conflict are those already most marginalized economically and politically. This is a critical moment for the peace process in Colombia. The Latin American Working Group has issued an urgent call to action for all American citizens. A dear colleague letter addressed to Secretary of State John Kerry and to US Special Envoy to Colombia Bernard Aronson has been sent by Representative James McGovern in support of the peace talks. 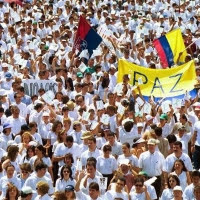 This action urges all representatives to sign the letter and support peace for the people of Colombia. demands four essential components:truth, justice, love and freedom"
The letter urges for the negotiations between the Colombian government and the FARC to be inclusive of those vulnerable groups of Colombian society most affected by the conflict, especially rural, indigenous and Afro-Colombian communities. The letter also urges for any peace accords reached to center on the needs of victims and contribute to ending Colombia's history of impunity. It is crucial for the U.S. government to take this historic opportunity to back peace for the longest running conflict in the Americas. Since the war began five decades ago, Colombians have been subjected to forced displacements, widespread massacres, kidnappings, threats against human rights activists, and the social exclusion of indigenous and Afro-Colombian communities. We cannot help but express our sorrow, as Christians and as human beings, in response to the deaths that continue taking place in Colombia, which could have been avoided with an agreement for a bilateral ceasefire. All lives are sacred, as Pope Francis reminds us in his recent Enclyclical Laudato Si': those of the civilian population, those in nature, those of soldiers and police officers, and those of the guerrillas. The government should change their position from refusing an agreement for a bilateral ceasefire to a position in favor of life and the greater legitimacy of the continued dialogues. The FARC should return to their willingness and decision to maintain a ceasefire. We call, with the power of the Gospel, for both parties to commit to a bilateral ceasefire and the de-escalation of the confrontation. As a non-Colombian working on issues surrounding the long-lasting armed conflict of Colombia, the relationship of solidarity is central. This solidarity, as discussed in the ELCA's model of accompaniment, means that I am learning to walk hand in hand with my Colombian counterparts regarding peace, justice and human rights; it means to be in a committed relationship of mutuality, collaboration and respect across economic, national and social boundaries. While the US government has impacted the conflict in Colombia in strong and various ways, and has massive influence over the Colombian government, the people of Colombia do not elect our leaders in the US. The solidarity between the church in the US and the church in Colombia must be centered on choosing life, on choosing peace for our brothers and sisters, and on the knowledge that our humanity is intertwined and inseparable from theirs. Urging our elected leaders to promote peace and justice for those Colombians suffering from the loss of homes and livelihoods, of family members and friends, as well as daily insecurity, among others, is a small act, a small way of constructing and maintaining the relationship of solidarity. P.S. If you haven't already, please don't forget to subscribe to our blog (in the upper right corner) - thank you for reading!